Scale insects are the most serious pests of many ornamental plants. There are 13 families of scales in Florida, the most common being armored scales, soft scales, and mealybugs. Scales cause damage by sucking plant fluids from leaves, stems, and sometimes roots. Some species feed on the underside of leaves, which can appear as stippling (small yellow spots) or chlorotic lesions. Heavily infested plants look unhealthy and produce little new growth. Heavy infestations can cause extensive leaf yellowing, premature leaf drop (defoliation), branch dieback and plant death. 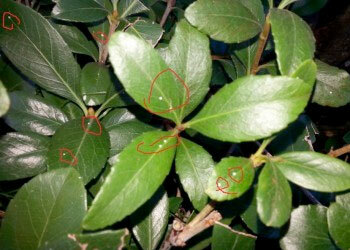 The above photo shows Florida wax scale on Indian Hawthorn. The Florida wax scale, Ceroplastes floridensis Comstock, is one of the most commonly encountered soft scales throughout the the southern United States. The mature scale is round and convex, creamy in color and is found on stems or tops of leaves. It is a soft scale, and supports the growth of sooty mold on the leaves beneath. Immature scales first appear as fine white dots, then develop a black body with a white fringe. Feeding damage results in chlorotic spots on the leaves and possible leaf drop. As with most scale, it may be present year-round. Crawlers hatch in spring and should be monitored throughout the warm season. Eggs are oval and reddish-orange in color, and fill the cavity underneath the bodies of dead or mature adult female scales. First stage (instar) nymphs, called crawlers, hatch from eggs over a period of 2 to 3 weeks and crawl to and settle on leaves, twigs and stems of host plants – thereby spreading the infestation. Nymphs will often line up on the veins of the upper surface of the leaf. After settling, nymphs insert their thread-like mouthparts into the plant and begin to secrete wax in tufts around the body that give them a star-like appearance. Female wax scales feed and develop through three immature stages (first, second and third instars) before becoming adults. Then there only purpose is producing eggs and dying. When removing individual adult female scales from leaves at certain times of the year hundreds of eggs will pour out of their body cavities. They overwinter predominantly as newly mature females. Male forms have not been observed in this species. This photo shows soft scale on croton. Over 60 species of soft scales occur in Florida. Soft scales also secrete a waxy covering, but it is attached to their bodies. Soft scales vary widely in color, size, and shape. They range from 1/8 to 1/2 inch in diameter and may be nearly flat to almost spherical in shape. Because soft scales consume so much plant sap, they excrete a lot of honeydew, a sugary substance. Soft scales and mealybugs excrete large amounts of honeydew which provides an excellent medium for the growth of a black fungus called sooty mold. Besides being unattractive, sooty mold interferes with photosynthesis and somewhat slows plant growth. Sooty mold usually weathers away following control of the insect infestation. Ants feed on the honeydew and when ants are observed, plants should be examined closely for these sucking pests. The adult female oleander scale is an armored scale that is about 2-3mm long and oval. It has a waxy covering that is whiter than olive scale with a yellow or light brown spot near the center. The adult male scale is elongate. If the coverings are removed, the female body is yellow, while the male scale is brownish yellow. This scale is most common on leaves in the lower part of the tree. There are several generations a year. Red date scale on Roebelinii. As with most scale insects, the adult female is the best life stage for field and laboratory identification. Adult females are small, spherical-shaped insects, with a body length size of approximately 0.04 to 0.06 inches (1 to 1.5 mm), and reduced or absent legs. Adult females are a red to reddish-brown color, and may be found embedded in a mass of white cottony wax on plant tissue. They tend to attack the spear frond first. The population will get so thick the spear leaf will not be able to open. This will inhibit photosynthesis and if left untreated will certainly kill the palm.